The window of an estate agent in Dublin. PROPERTY PRICES ARE continuing to rise and an expected winter slowdown hasn’t materialised. That’s judging by new stats released by the Central Statistics Office which showed that the price of residential property across the country increased by 1.1% over the course of November. The monthly rise follows on from a smaller rise of 0.4% in October. It means that property has continued to increase in value across the winter, even picking up pace in November, when activity usually slows. Year-on-year, property prices were 11.6% higher in November than they were in the same month in 2016. The previous 12 months had recorded a 9.2% increase, meaning the gains have accelerated over the past year. Year-on-year price increases were recorded in all regions, with the rest of Ireland (at 11.7%) now outstripping price growth in Dublin (11.3%). Property prices from 2005 to present. 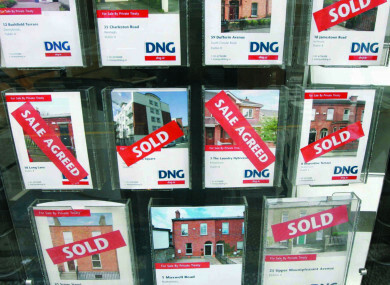 The CSO says that national property prices have increased by 71.6% since the bottom of the crash in early 2013. Dublin prices have grown even further since the trough and are now 88.1% above what they were in February 2012. The CSO points out that property prices are still 23.1% lower than their highest point in 2007. Reacting to the news that prices grew again in November, Conall MacCoille of Davy Research said prices have increased at a time of the year this is not usually expected. “So far, there is still no sign of the usual seasonal slowdown during the winter,” he said. Email “Even the winter can't cool down the rapid growth in property prices”. Feedback on “Even the winter can't cool down the rapid growth in property prices”.